A Quick Pick Crane Service of Derby, CT will now be the home of a large 400 Ton hydraulic crane. The 2nd largest in the state, the crane will be put to use on a multitude of construction and industry projects. A crane of this size has multiple applications in construction and industry. A Quick Pick Crane Service announced today that it has closed a deal to buy a 400 Ton hydraulic crane. The 400 Ton Liebherr 1350 - 6.1 will be the 2nd largest hydraulic crane in the state of Connecticut. The machine offers 230’ of main power boom, 439’ total tip height, and maximum horizontal reach of 310’. A crane of this size has multiple applications in construction and industry. It can assemble large tower cranes used in the construction of high-rise buildings, bridge assembly, large precast buildings and structures, windmill construction, power plant construction/maintenance, and hoisting air conditioning units in hard to reach areas. Its mere size makes it a rare machine and thus will be a regional crane traveling throughout CT, NY, MA, RI and beyond. The company will take delivery of the crane early this week and train directly with Liebherr representatives for the following 2 weeks. After that, the machine will embark on its maiden voyage to perform a job in northern Connecticut. It will then return to Derby as it awaits the arrival of its 256' luffing jib and a potential public showcase. 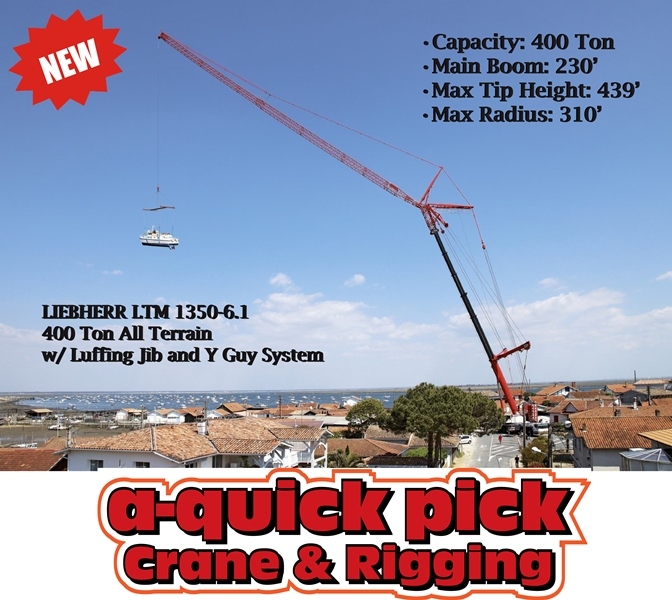 A Quick Pick Crane Service is a family owned, union crane and rigging company based out of Derby, CT, with cranes ranging from 17 ton to 400 ton. In addition to hydraulic cranes the company also offers boom trucks, rough terrain, crawler, self erecting tower cranes, heavy rigging and transport service.